Without having to launch these comedies on Friday at this time, we can keep our promotion focused on earlier in the week — plus we will have both comedies in our back pocket if we need to make any schedule changes on those nights. When we have a better idea of viewing patterns in the next few weeks, we will announce new season premieres of Whitney and Community.” Ha ha, more horrible news for the beleaguered Community, right?! Well, maybe not. 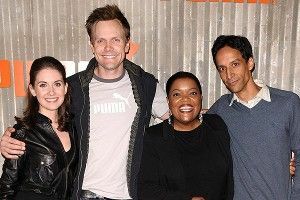 yes, bring Community back to Thursday nights after all, where it might prove a better fit with either Parks or 30 Rock.” Either NBC is just interested in dumping Community’s body by the side of the road, or it really is trying to figure out the best time to promote and best night to air the damn thing. And with that, Community’s ratio of “level of analysis” to “number of actual human viewers” rises to ever more comically uneven heights.